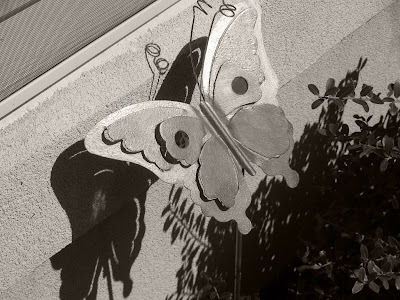 A yard art butterfly basks in the sun early in the morning. I like the hope the sight of a butterfly is stirring. I also envy the strong sun casting exciting shadows on the brick wall. Butterflies are a real sign of warmer weather... and until I see the real thing, we can enjoy your butterfly soaking in the sun. I love butterflies and now we soon can see them again after a long winter. Today I bring a newer stamp showing an older map of Denmark!